Weddings cannot do without the use of matching ribbons for its accessories. From the ring pillow to the bridal chair décor to the wedding favour boxes and many more, matching ribbons are absolutely important. If you are planning for a wedding or wedding bells are ringing soon, do start to consider the colour theme and feel you wish to have for your important day. By settling on the theme colours early, it will leave you and your brides maids plenty of time to gather the materials you will need to DIY or to add on a special touch to your wedding. For bridesmaid dresses, you can pick out matching broad organza or lush satin ribbons to be used as sashes on the dresses or to be made into hair accessories or wrist corsages for the girls. To complete the entire look of your wedding, you will need to have the right ribbons to add the magic touch to all your accessories. 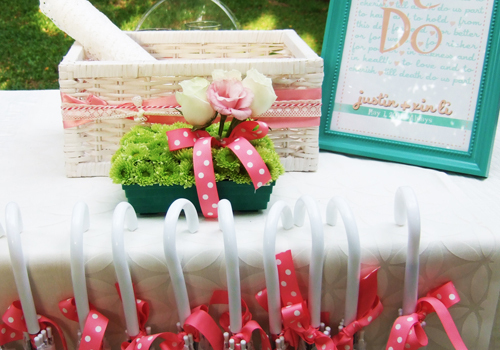 Below are some pictures taken from a wedding which cleverly used pastel polka dotted grosgrain ribbons and an assortment of ribbons to inject the desired theme. 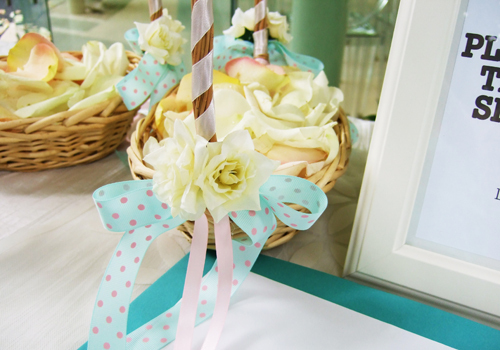 Usually patterned grosgrain ribbons are exceptionally great for weddings with a strong theme. For those who prefer more subtle or classical themes, satin with organza ribbons will suit the occasion best. Use the same colour tones or a mixture of a few matching tones of a variety thickness of ribbons generously on all your wedding accessories like stationery, pews or pillar décor, corsages, flower girl baskets, favour boxes, or just anything you will need for the wedding to make it complete. You can take a look at the videos from www.florist.sg to see how ribbons have been creatively used on wedding favour boxes, ring pillows and more!